The Fords benefitted from some chassis and suspension upgrades for 1961. They were equipped with a 390 CID V8 with hydraulic lifters, straight stick, and 3.73:1 rear axle. With the low gear ratio, they were prone to valve float around 105 mph. Changing to a 3.1:1 axle, as in the cars with automatic transmissions, increased top speed, but acceleration suffered. 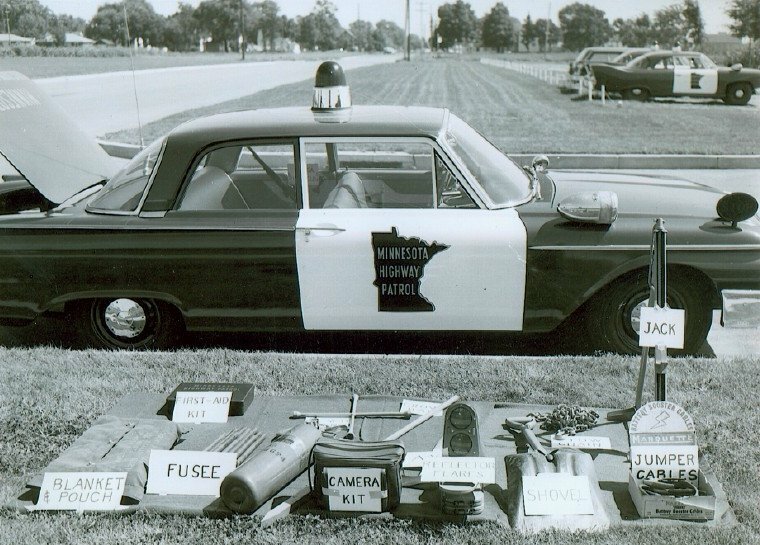 The Minnesota Highway Patrol had many 1961 Plymouths. Purchased in small quantities throughout the model year, early ’61s used the 361 V-8, but most used the 383 V-8. A small number of late-year cars used the 413 V-8. Most had automatic transmissions. Advertised as being wind-tunnel designed, the 1961 Plymouths were fast and excellent handling automobiles. Photo courtesy of the Adolph Rosetter family. The 1962 Dodge Dart was arguably a strange looking machine. Equipped again with the 361 Golden Commando V-8 with 4-barrel carb, rated at 305 hp and 395 lb-ft torque, automatic transmission, and 3.23 gears, the Dodges and their Plymouth counterparts were admirable performers. The wheelbase of the Dodge and Plymouth pursuit cars dropped to 116 inches. They were smaller and lighter than in previous years, but used the same powerful 361 V-8 engines and TorqueFlite transmissions. The 1962 Ford was equipped with a 390 CID V8 rated at 330-horsepower at 5,000 rpm. Mated to a Cruise-O-Matic transmission, the specially equipped Interceptor 390 featured a 4-barrel carburetor, solid lifters, a high-lift cam, "shorty" exhaust headers, and dual exhaust. The solid lifters alleviated the valve float experienced with the 1961 hydraulic lifter equipped units. Del Boll is pictured with this 1963 Ford 300. The drivetrain was carried over from 1962, utilizing the 330 hp 390 CID V-8, Cruise-O-Matic transmission, and a 3.0:1 rear axle. 1963 Plymouth Savoy Pursuit was powered by a 383 CID V8 rated at 330 hp and 425 lb-ft coupled to a TorqueFlite automatic. They were relatively light weight, quick, and good handling. Some who drove these cars say they were a great machine as long as you kept them moving in a straight line. They were heavy in the frontend and tended to understeer or “plow” their way through corners. Ford again equipped these units with the 330 horsepower 390 CID V-8. These were equipped with the 330 hp 383 CID Super Commando V8 and rode on a 119 inch wheelbase; the longest to date for Plymouth. A little heavier than the Plymouths of the few previous years, they didn’t perform quite as well, but were still very respectable. Photo provided by L.A. Nesvik. Photo provided by D. E. Kremer. 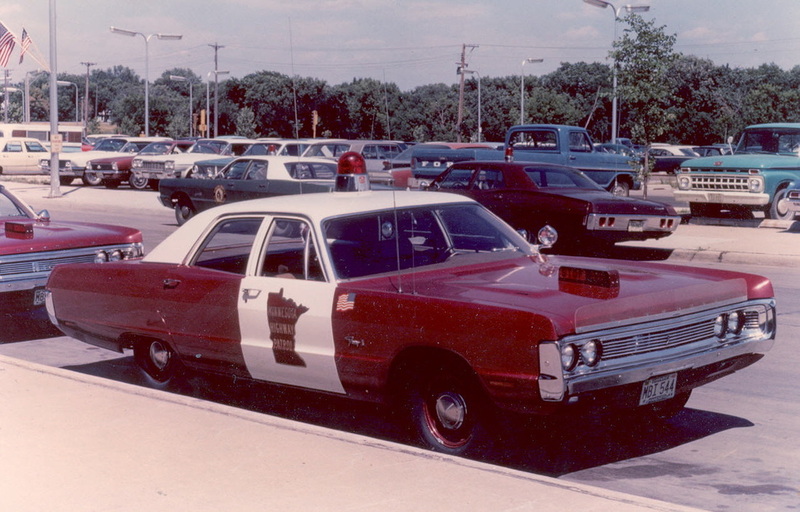 1967 marked a few milestones in the Highway Patrol’s fleet history. These were the first 4-door patrol cars, the first equipped with power steering, and the first to be equipped with the legendary 375 hp 440 cubic inch Super Commando V-8 with a torque rating of 480 ft-lbs. 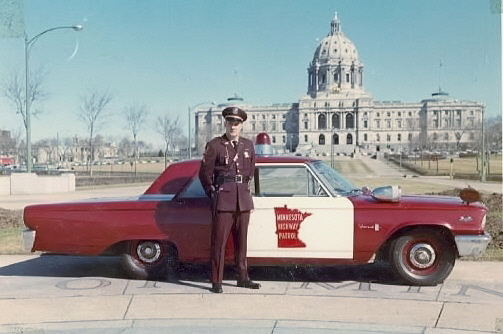 Only the front doors were painted white; a look that became the hallmark of the Minnesota State Patrol for the next 25 years. The 1968 Ford used a 428 CID V-8 and 2.8:1 rear axle. Due to the construction of the hood panel, the front corners of the hood would begin to lift at moderately high speeds and frighteningly so at even higher speeds. One legendary ride with a certain Sergeant in the Marshall District was all it took to convince the Ford rep that something had to be done about this malady. Soon after, Ford provided aftermarket hood pin kits to be installed on these units to insure the hood wouldn’t come apart or fly open at high speeds. A properly tuned ’68 Ford would hit top end well in excess of 130 mph! Photo from the L.A. Nesvik collection. Photo courtesy Greg Reynolds and www.copcar.com. The 1969 Fords were the last of the units to display the gold star on their roofs. To aid in cooling the cars in the hot summer months, 1969 Fords received this new tutone paint treatment and the stars were removed in the process. The roofs on many of the 1968 cars were repainted white, as well. White paint was cheaper than air conditioning! Also new for 1969 was the hood mounted bi-directional STOP light. Sirens were mounted under the hood. These cars ran a 429 CID V8 power plant, 3-speed automatic transmission, and 3.0:1 rear axle. The 1970 and 1971 Plymouths were nearly identical. All were equipped with 440 CID V8 engines, although compression ratios began to drop. Previously 10.1:1, compression went to 9.7 :1 in 1970 and 9.5:1 in 1971. 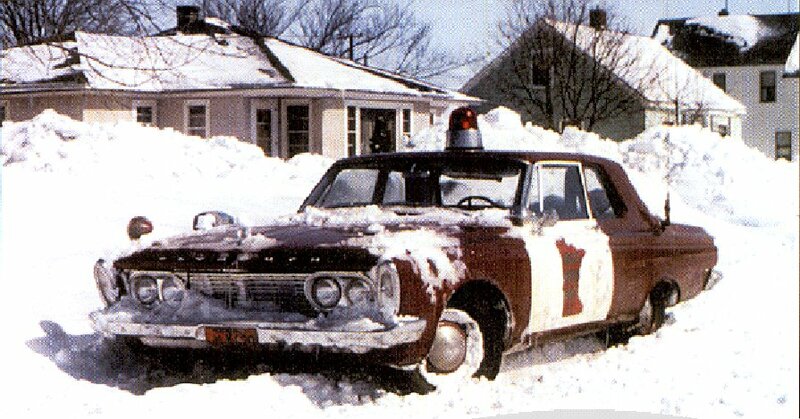 1971 would be the last year the front doors were painted white and the last year the cars required premium gasoline. Photo courtesy of Greg Reynolds and www.copcar.com.